Just because you can, still doesn't mean you should. My most popular post ever featured some of the funniest yarn work ever found on the internet. If you're a fan of this blog, I don't have to explain it to you; you're already laughing. If you're new, click that link I posted to see the amazement. If you're lazy, then let me just tell you that they were ice cream colored, crochet short pants. And I've just discovered where they came from. It's not from some random granny hoping to keep her sonny boy home bound and socially dormant well into his 40s, oh no. These are produced by a dude. A dude named Spooner, and his wearable works of... art... can be yours too! These kickin' pants? A mere $500! 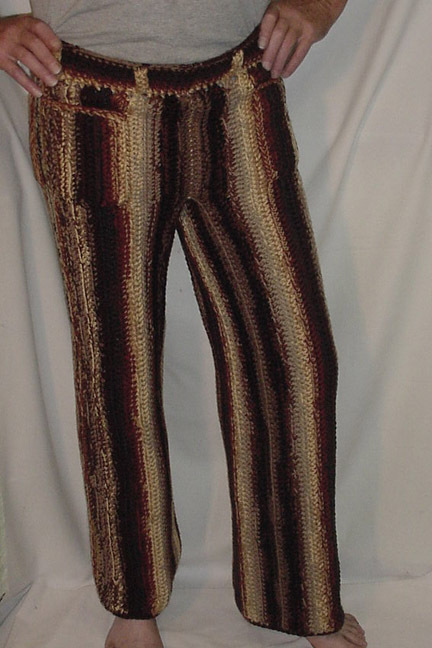 But for $500 I don't want something as subdued and simple as BROWN crochet pants. NO! 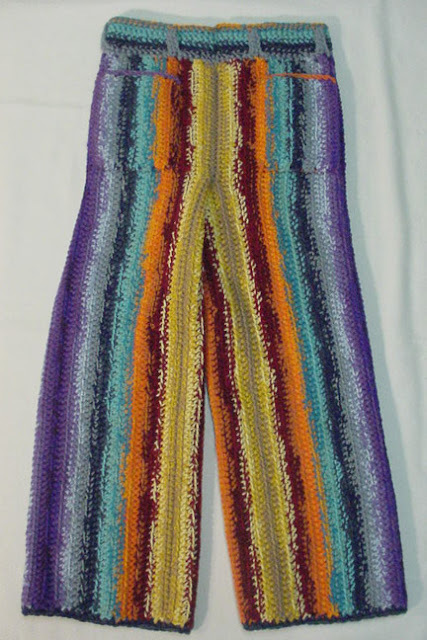 I want a Technicolored dream coat... of pants. I want it to look like Rainbow Bright tossed her ROY.G.BIV cookies all over the lower half of my body. 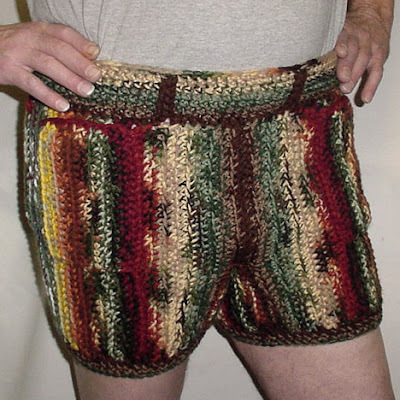 Fortunately, Spooner's been around since the days of Woodstock, crocheting up pants, shorts, skirts and more in the acid colored hues of the 60s and 70s. So you don't have to settle for the "business casual" colors of that first pair I posted. You can totally rock these bad boys. Or, as I've named them: "Melted Crayola Trousers." Live in a warmer climate? Not a fan of vibrant colors? Looking for a way to stand out when you're kickin' it with other short pants enthusiasts? $300 and the ability to order things online will do it. 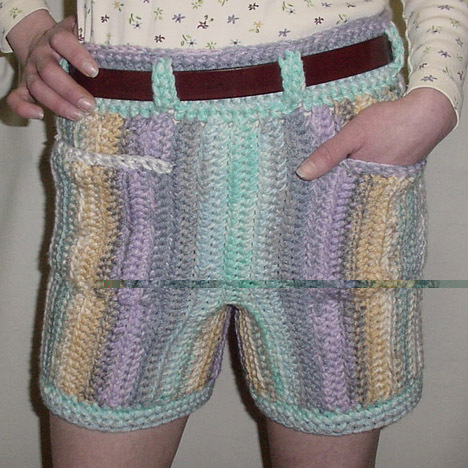 These pastel lady pants will make you all the rage at the country club, beach retreat, or good old-fashioned love in. Not a lady, you say? Looking for something a bit more manly, something to wear around the hunting lodge with your bros while sipping a few brewskis? Look. no. further. You manly men can get in on the magic right here. And let me tell you, $300 for the powerhouse of masculinity these shorts offer is a bargain. You won't even mind awkward sweating and constant chaffing! 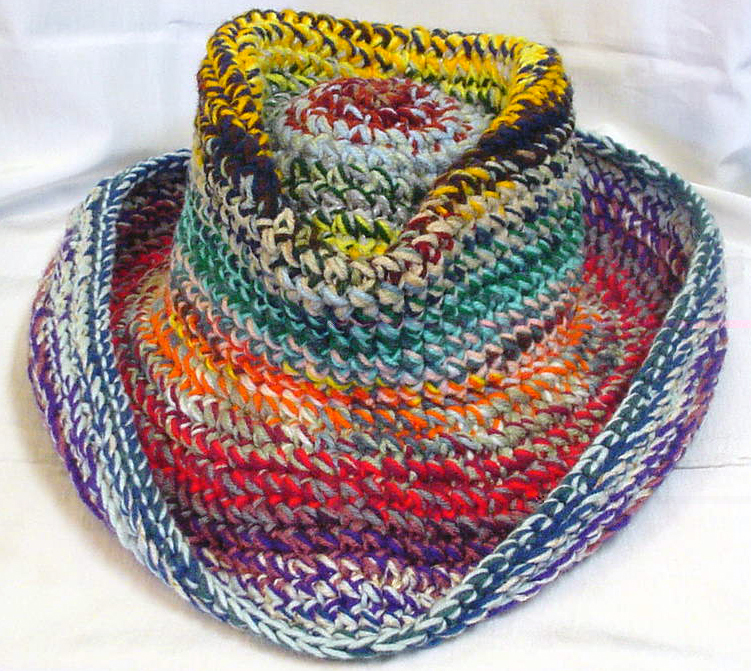 Or maybe a $150 multicolored, crochet cowboy hat is more your speed. I'm sure all the ladies will be checkin' your swagger when you pony up to the bar in this. "Howdy Ma'am, I see you're admiring my hat. That's a fine crochet skirt you're workin' there yourself, little lady'. Maybe I can buy you a drink tonight, darlin'? *wink* Barkeep, a couple of prune juice and Metamucil tonics, por favor. " How about a doll for your child? $100 provides endless companionship. Nothing says comfort like black, lifeless eyes, a fang like smile, and a body in various shades of red ranging from "fresh kill blood" to "dried blood stain." Give him a hug! But who is the man who has brought us these treasures? Who is Spooner? Spooner is this guy, and may I just say, WOW. That... pair of pants? Overalls? Leg sweater? Uh, that garment is truly amazing. From the bold mishmash of colors to the built in suspenders and especially the flared bell bottom legs, that outfit screams "I do what I want! ...And what I want to do is crochet, crochet like you've never seen before!" Congratulations, sir. You've succeeded. Mr. Spooner is a man unto himself, a maverick, a free spirit. He marches to the beat of not only his own drummer, but a completely different band. 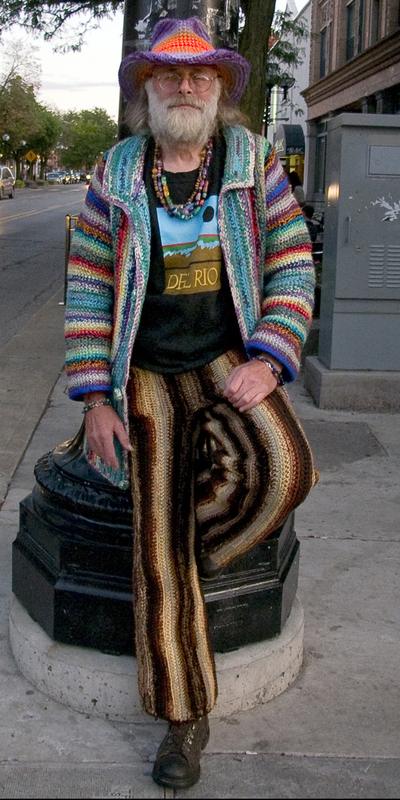 "Better to crochet for yourself and lose the public than to crochet for the public and lose yourself." Is he married? Because, if not.....? I'm available. They are pretty amazing, Robyn! They definitely took some skill to create! I'm just... speechless. Due to the shock, of course. Zombies... 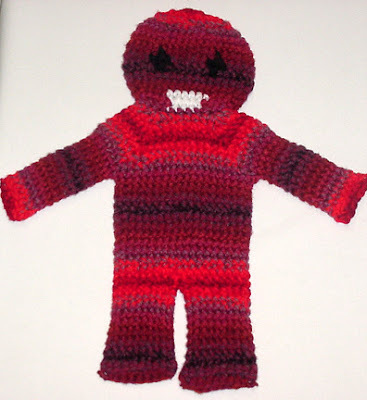 They're Crap at Knitting. Ski Masks... Never A Good Thing. 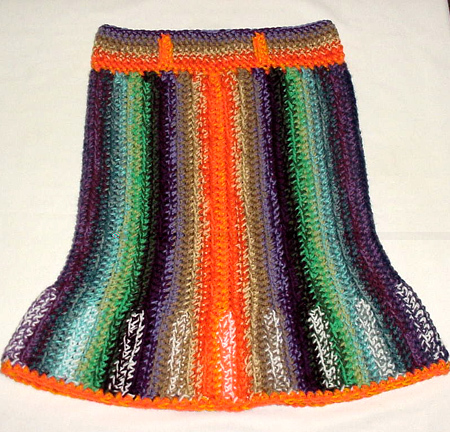 The Crafter's Corner: Old Sweater Edition! Seriously, Amazon Prime is amazing. I used to have this on here as a bit of a joke, but now I'm raising money for an actual important reason. If you'd like to know more, please feel free to email me. Don't Fight The Crowds This Christmas! Come check out my posters and t-shirts! Get some great design at great prices!